My Thoughts: We are introduced to Lucy who is a survivor. The Plague has come and gone (so we think) and Lucy managed to survived while the rest of her family died. She has been living alone for the past year trying to make it day by day. She has hunted animals, collected water, and has had to wash her clothes in the muddy swamp. She has done what she needs to do to survive. Spending a year alone can be quite the lonely experience. Until one day when big scary dogs are after her and she meets Aiden who helps her out (or up a tree). She doesn't know what to quite make of him. She finds out he lives up the road a bit with a bunch of other people trying to survive as well. After her camp gets flooded she goes and finds him. When she gets there she meets tons of people including the cute Henry, Aiden's brother Sammy, and Aiden's friend Del. There is another set of people throughout the novel. They are the people at the hospital who keep capturing people. Once someone is captured they never are to be seen again so nobody really knows what goes on there. Del, Aiden, and Lucy set out to find out what the people are up too before its too late. I'm going to stop there or else I'll give away everything. I did like this book but it doesn't make my favorites list. It is being compared to The Hunger Games and I just didn't quite feel the reflection. Yes, it's good on its own standing but nowhere near up to par of The Hunger Games. I liked Lucy, she was very determined and brave. I also liked Aiden. He was a sweet guy who made a nice love interest to Lucy. I never once liked Del. Just something about her put me off. 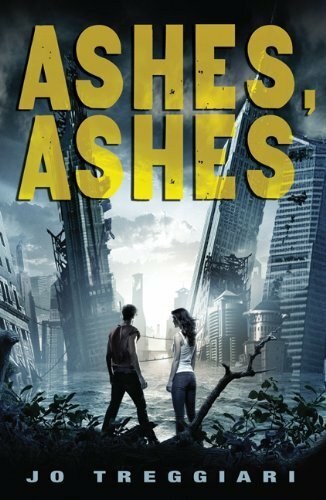 Ashes Ashes was an interesting story. Overall: I did enjoy Ashes Ashes but isn't one of my favorite dsytopian books. It was different than most dsytopian books I've read lately. Cover: Like it, its eye catching. I like the girl and boy and all the tall buildings.